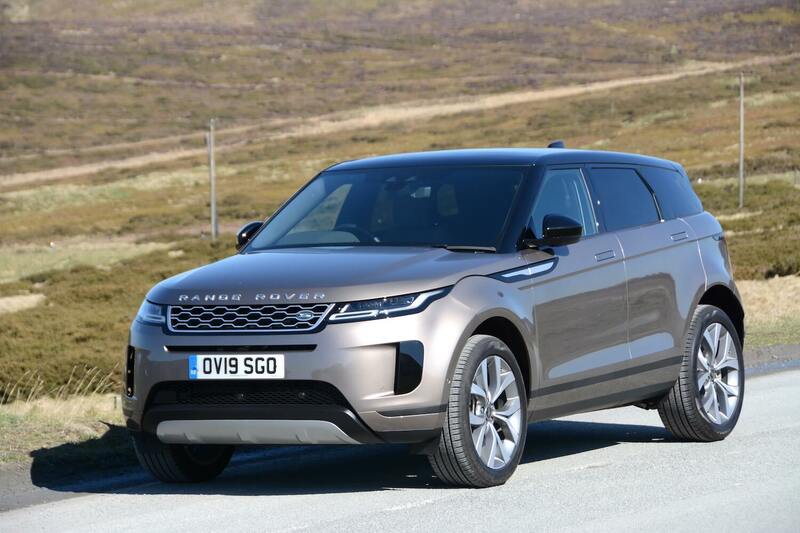 As soon as we saw the original Range Rover Evoque we knew it was going to be a success. With its big wheels, wide wheel arches, and narrow glass area, it looked like a concept car, yet the production version was virtually unchanged from the concept. 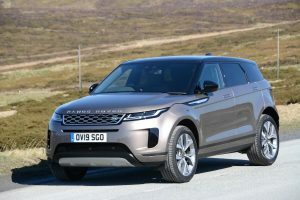 After achieving global sales figures of 785,000, which provided a huge financial boost for Jaguar Land Rover, and which helped to kick-start the expansion of other model lines, the time has come for an all-new Evoque. 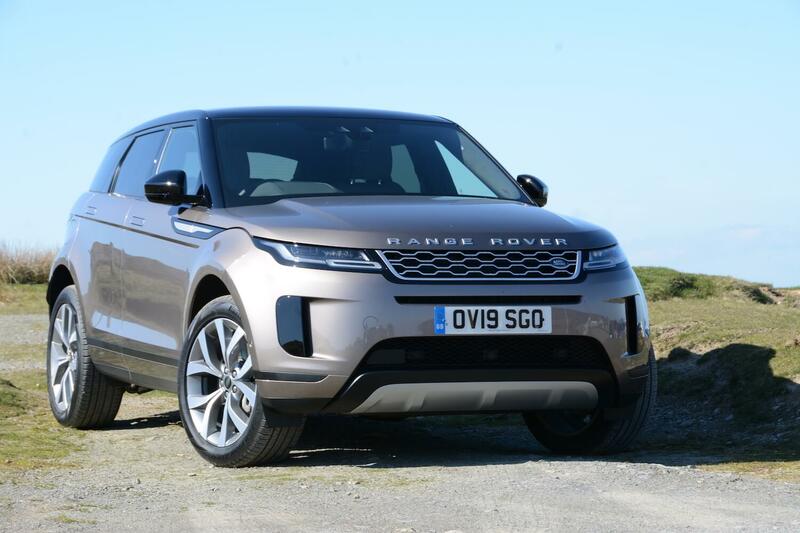 The design concept remains largely unchanged from a silhouette point of view, but a short drive is all that is needed to reassure you that this new Evoque has the improvements required to guarantee that this is also likely to be a big seller. 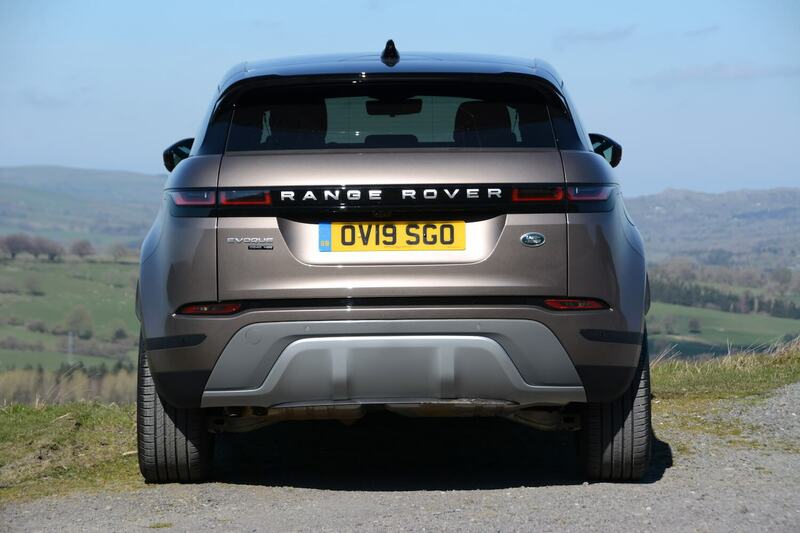 Although the latest Evoque looks similar overall to the previous model, it’s actually all-new (only the door hinges are carried over from the old car). 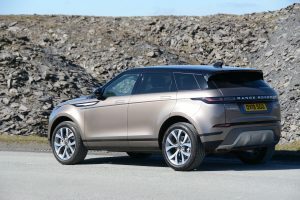 The launch event included a visit to Jaguar Land Rover’s Halewood factory where the Evoque is manufactured, and the tour of the production line showed how the packaging of the new Evoque has been optimised to accommodate petrol engines, diesel engines, mild hybrid (MHEV) technology, and – yet to come – plug-in hybrid technology (with a 3-cylinder, 1.5-litre engine). Amazingly, all this has been packaged into the new platform without any reduction in ground clearance or loss of interior space. 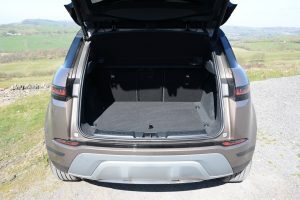 In fact interior space has actually been improved in the new model, as this was one of the main criticisms of the old Evoque, particularly the small boot. 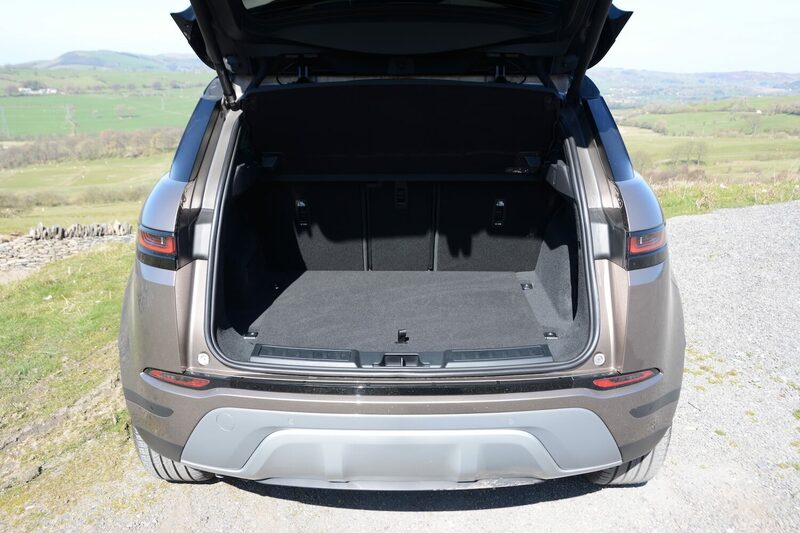 Despite the overall footprint of the new Evoque remaining similar to that of the old model, there’s a longer wheelbase, giving 20mm of extra rear knee room, and the luggage space is 10 per cent larger, now at 591 litres. There’s even a larger diesel tank. 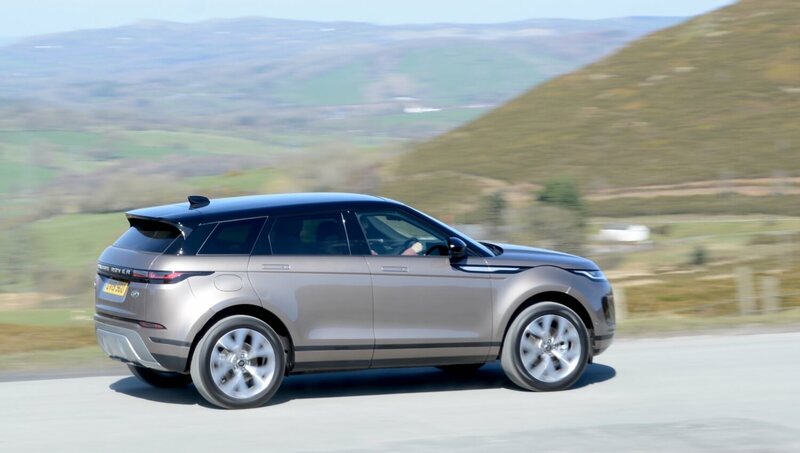 The exterior looks very recognisable as an Evoque, but the styling has become more sophisticated, with the influence of the Range Rover Velar in the rear end particularly evident. The interior is much more high-tech than the previous model. 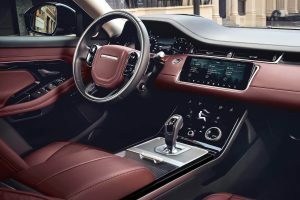 There’s a digital instrument display, a large touchscreen, and below this there’s another touchscreen featuring climate controls – this is the Touch Pro Duo technology found on the Velar. Sometimes all the controls can be a bit overwhelming, particularly the multi-function climate controls. And the Evoque even features a ‘ClearSight’ digital rear-view mirror – you can flip it between traditional mirror and widescreen camera while driving – very clever. There’s also the option of Ground View technology, which use cameras to project the view under the bonnet onto the touchscreen. Our test car featured an Ingenium 4-cylinder, 2.0-litre 240hp diesel engine, 9-speed automatic transmission and all-wheel drive. And every Evoque on sale in the UK, apart from the entry-level model, also features a 48 volt mild hybrid system. This means that energy is recovered when braking (at speeds below 11mph the engine will switch off) and is stored in an underfloor battery, and the energy is used when accelerating. 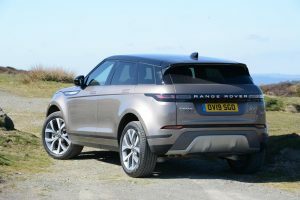 After setting off from the launch event base at Peckforton Castle in Cheshire it didn’t take long to become aware that the new Evoque is much more refined than the previous model. You were usually aware of the diesel engine in the old model, along with a degree of road noise; not so with the new Evoque. A lot of work has been done in the engineering department to improve refinement, and you can tell. Another area where the improvement is noticeable is when cornering. The original Evoque could feel somewhat bulky and imprecise through corners; things have improved with the new model. This is a relatively large SUV, so we’re not talking sports car levels of agility, but the steering feels sharper and the mass of the car does seem to be kept in check much more effectively. Motorway manners are also impressive, in terms of noise levels and ride quality, and again, much more Range Rover-like than before. Performance is good from this 240hp diesel powertrain, although not blistering. Reactions from the 240hp diesel engine and 9-speed automatic transmission are generally smooth and without delay, however there were a few occasions when depressing the accelerator didn’t result in an instant response. One omission was that there were no steering wheel-mounted paddles to change gear manually. 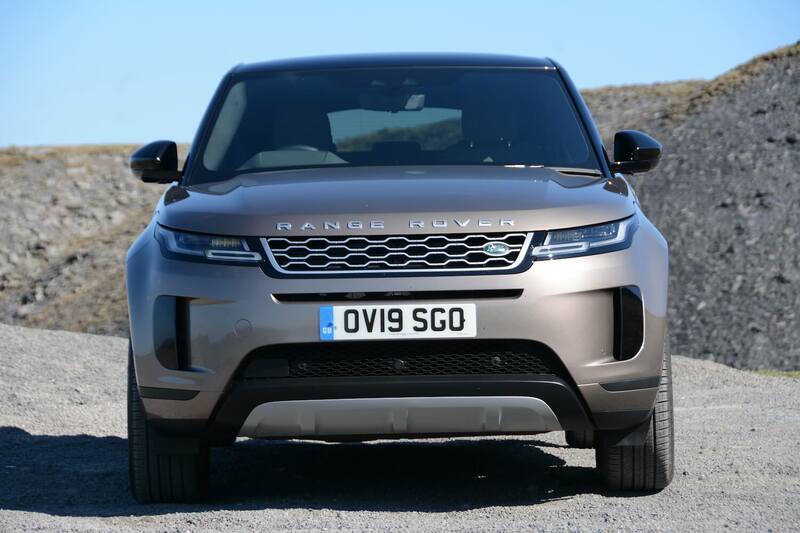 The launch event test route started in Cheshire, went to the JLR factory in Halewood near Liverpool, then headed out into North Wales, before returning to Peckforton Castle, where there happens to be a Land Rover Experience Off-Road course. Having spent a good few hours in the car on the road route, and being impressed with the levels of refinement and improved driving experience, when the off-road course through a long-abandoned quarry became visible, you were left wondering if the circuit was more appropriate for a Discovery with air suspension rather than a new compact Range Rover that had seemingly been primarily designed with tarmac roads in mind. However when faced with mud, water, steep ascents and steep descents, from the driver’s seat the Evoque seemed to cope easily with it all (the new Evoque has 212mm of ground clearance and 600mm wading depth). 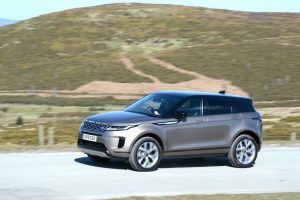 If you were a fly on the wall somewhere in the Evoque’s all-wheel drive system then you may have witnessed some hard work going on, but if so, the occupants inside the car were blissfully unaware of any such strenuous activity. The Evoque features Terrain Response 2, which enables you to select the off-road settings that you want, or it does it for you automatically. We tested the original Evoque on a serious off-road route (read the review and watch the video), and again when the 9-speed automatic version came out (read the review and watch the video); our expectation is that the new Evoque will be at least as capable in such conditions. The official WLTP combined fuel economy for the Range Rover Evoque D240 HSE is 40.4 – 37.9 mpg with CO2 emissions (NEDC Equivalent) of 163 g/km. It wasn’t possible to carry out any form of accurate real-world economy test on the launch event, however the dashboard fuel economy read-out displayed an average of 40.4 mpg for the route, which, bizarrely, exactly matches the maximum quoted NEDC Equivalent combined fuel economy figure. We must have been driving carefully (most of the route was 50-60 mph A and B-roads) – or perhaps this was the result of the vehicle’s mild hybrid system. Most Evoques sold in the UK will be diesels. This is despite all the headlines in the media, and the mixed messages from government, about diesels. The reality is that old diesel trucks, buses and vans create the worst emissions from a local air quality point of view; independent tests have recently shown that the latest JLR diesel vehicles have very low NOx emissions. 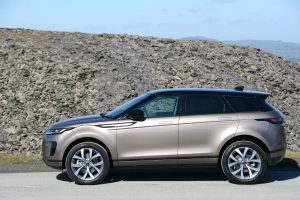 The Range Rover Evoque D240 HSE Automatic AWD costs £47,800 – before any options. Options fitted to our test car included Kaikoura Stone Metallic Paint (£640), Black Contrast Roof (£535), Ebony Morzine Headlining (£240), Fixed Panoramic Roof (£1,100) and Privacy Glass (£350) – taking the price to £50,665. This is certainly at the top end of prices for cars in this class, presumably this is why JLR’s engineers were tasked with making the new Evoque as refined as possible in order to justify the Range Rover price tag. However, most people won’t buy an Evoque with cash, they will instead take out some form of finance for the car. Because the residual values are forecast to be good, the monthly price will be more competitive than the outright purchase price suggests. The model range includes diesels – the D150 (the only front-wheel drive and manual model) (from £31,600), D150, D180 and D240 as tested; and petrols – the P200, P250 and P300. 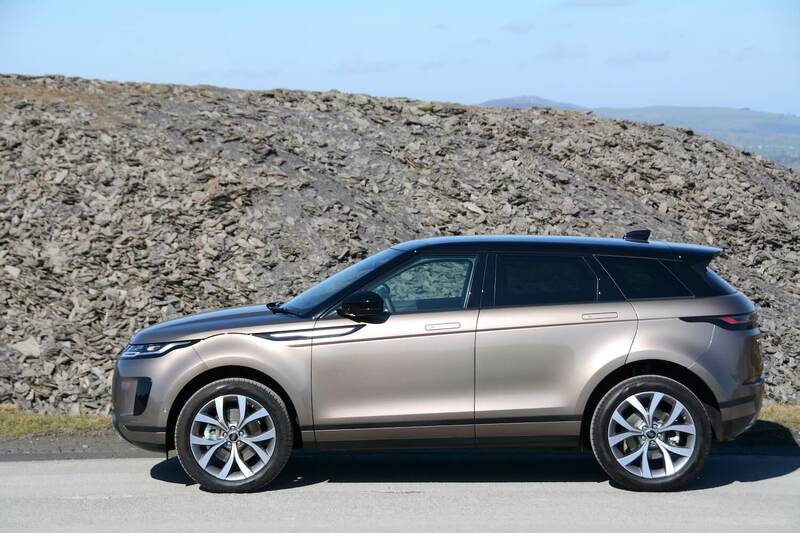 The original Range Rover Evoque was effectively a concept car that made it to production form mostly unchanged. So, visually, it looked amazing, and it was capable off-road, however there was evidence of Land Rover underpinnings when driving it, in particular a grumbly diesel engine. And although it felt like a relatively large vehicle on the outside, it wasn’t particularly spacious inside, particularly in the boot department. The new platform addresses these issues, and the result is a new Evoque that still looks striking on the outside, with a greater degree of sophistication in terms of styling details, and the driving experience is much more refined, yet it still proved itself to be capable off-road. So this is a 9/10 car, but if you take the emissions into account, 163 g/km CO2 can’t compete with the likes of the Mitsubishi Outlander PHEV, with 40g/km CO2, so the Range Rover Evoque D240 HSE Automatic AWD gains a Green Car Guide rating of 8 out of 10. We look forward to reviewing the plug-in hybrid Evoque, which is due to come before the end of 2019.